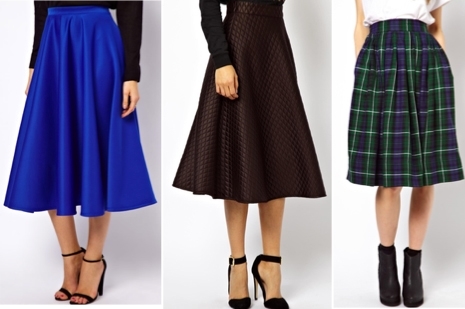 So, how can you wear something like a full circle skirt without feeling like you’re in costume? Below, I’ll be showing you two looks — one for day, one for night — to keep this gorgeous silhouette fresh and modern. Get a youthful-yet-chic daytime look by pairing your skirt with a classic striped long-sleeved tee. Very Parisian, non? Keep things casual with a rugged dark-wash denim jacket — playing with texture creates nice contrast that keeps you from looking too dolled up! Simple but sophisticated accessories are key for tying the ensemble together. 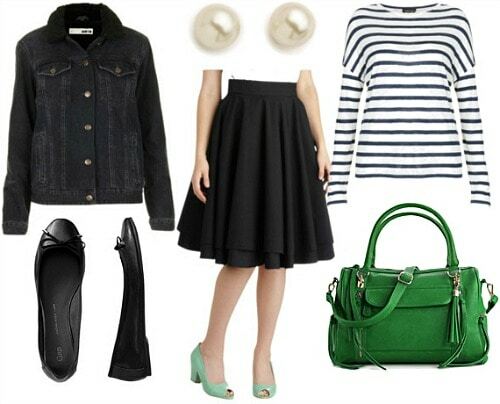 Grab a pair of basic black ballet flats, a to-die-for kelly green bag, then complete the outfit with a pair of elegant pearl studs. When you’re working with such a classic silhouette, it can be tempting to go all-out ’50s pin-up girl, but adding modern twists here and there makes this skirt much more versatile (and bar-friendly if you’re 21+). Pair it with a slouchy-chic grey tee and a blinged-out bib necklace for a youthful spin that’s perfectly on-trend. Now it’s time to grab a chic black-and-white cross-body bag and a pair of classic ankle-strap pumps to add some extra glamor. Complete the look with extra sparkle – a pair of giant crystal earrings will do the trick! Would you wear a full circle skirt? How would you style this one? Be sure to let me know what you think of the outfits in the comments, and what other pieces you’d like to see featured on Class to Night Out!